This post is Part 10 of a series to augment the Atlas of the Known World available for free download. Start with Part 1 here. Lifeblood of trade routes and pirates alike. You voted The Katei Ocean winner of January 2015 by 82%. 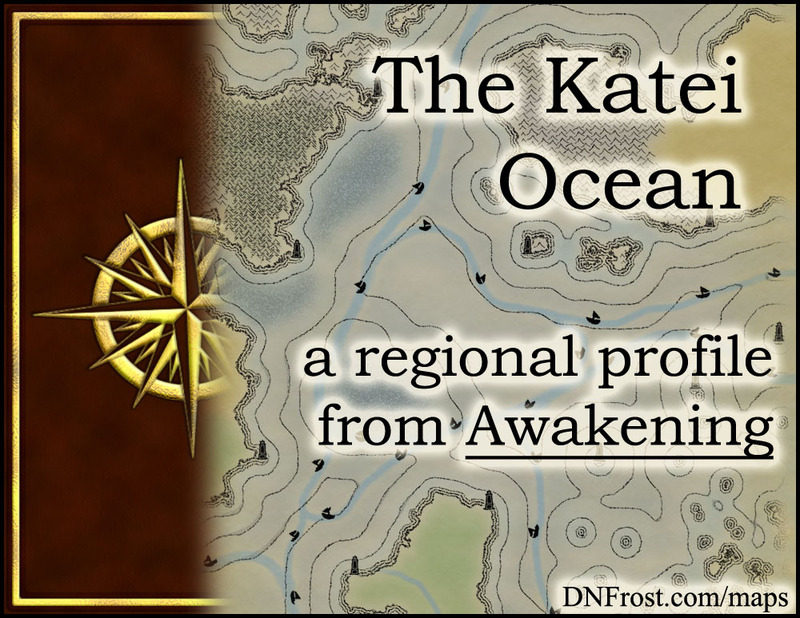 In Chapter 7 of Awakening, the Katei Ocean lies at the heart of the Known World. This body of water connects the eastern lands of Kholl and Dohar with the western lands of Allana and Kanata. Renowned for its powerful clockwise gyre, the Katei Ocean supports the merchant fleets that circulate the Known World. The currents from the frigid north bring nutrient-rich waters into the warmer southern regions, which in turn carry temperate waters and gentler weather up Allana's east coast. This region also borders the Gulf of Lohki, the Back Rishi, and the Sutek Desert. In the southwestern corner of the Katei Ocean, vast kelp beds take advantage of the swift currents converging there. Innumerable crabs, shrimp, and small fish inhabit these kelp forests, as do a few diminutive species of sea wyverns. Along the western edge of the Katei, cultivated coral reefs form the mer settlements of Rovikya, where schools of parrotfish used for coral landscaping and domesticated herds of sea wyverns have replaced the wild creatures that once roamed its temperate waters. The eastern Katei is mostly open ocean dotted with islands, and the merfolk share tales of sharks and eerie fish that dwell in the depths beneath the light of day. The mers of Rovikya wear no clothing, but are easily distinguished by their fanned tail-fins and semi-circular scales. An earless race, the Rovikye sport the characteristic rib-stribes common to the western reefs, and their arm webbing spans from hip to the first knuckle of each hand. Allied with the other mers of the Known Oceans, most particularly the ones at Dynde, Rovikyan mers are peaceable but prejudiced folk who contribute to the collection and analysis of prophesy across reefs. While the reefs along Allana's eastern coasts are populated almost exclusively by blue mers, the green mers who do not provide cheap labor are sequestered to the south of these reefs, in the swift currents and thick kelp beds known as Sonne Rovikya. For all mers, magic divisions align less with regional boundaries and more with the color of a mer's scales. Green mers excel at elemental and sensory magics, with their water and light magics far exceeding that of their blue cousins. Greens, however, are poor with special magics, and it is the prophetic Gift of the blue mers that triggered their rise to superiority. While the blue women are able to scry and see visions of the future, the blue men are able to slip into prophetic trances and predict the future verbally, which has led to rajaweh, large male-run libraries of prophesy dating back thousands of years. Due to the prevalence of prophesy in mer life, foreknowledge is valued over all else. A virtuous woman must use her visions of the future to aid the governing seyodi. A virtuous man must provide his prophesies and analytic services to his local rajaweh library. Because only the blue mers have the prophetic Gift, blue is considered the most esteemed color, rich with magic and favored by the deity called Mother. In fact, the mer word for blue, raja, is also the mer word for king, and it's used in the compound word rajaweh. There is nothing more offensive to a blue mer than to be likened to one of their Giftless green cousins, so more common and less flagrant insults tend to impugn a blue's prophetic contributions to the community. Age is measured in years using the solunar calendar of the merfolk, with the new year beginning on the winter solstice at 1:1:1:1 of each year. Coming of age, however, is rarely celebrated. Families are matriarchal, and daughters come to assist their mothers in legislation and administration of law in the civilian seyodi upon reaching adulthood. Sons, on the other hand, come of age and join their absent fathers in the rajaweh to perform their highest calling of contributing and interpreting the foreknowledge accessed through their prophetic Gift. Though blue mers do not wage war in order to better pursue knowledge of the future, the green mers of Sonne Rovikya have developed their own brand of violence outside the strictures of seyodi law. Without a police authority to maintain order, numerous gangs jockey for supremacy under the cover of the kelp forest in which they live, and few escape the pervasive reach of gang rivalry. While spilling blood is avoided to prevent attracting sharks, conflicting greens often use bludgeoning weapons to intimidate and extort brothels, casinos, and honest businesses alike. The Rovikye speak the language of the merfolk, Vyehedaryn, or Meri, as it's more commonly known on land. A genesis language for the land-tongue Allanic, Meri is not intelligible to the landfolk, but it sounds archaic and somewhat familiar, as many Allanic words were once rooted in the Meri language. The lyrical tongue of the merfolk is written in a curvaceous script stacked in rows from bottom to top, and due to extensive documentation and cross-referencing of prophesies across millennia, Meri has changed very little throughout recorded history. In the book Awakening, Larin and Jorn escape slavery in Kholl to cross the Katei Ocean on a Kanatan merchant ship. En route to their destination at Port Myre, their ship encounters a deadly wave sent by a mer. Through pleading with the lady mer, Larin learns that she's connected her visions of death to their ship's impending arrival. Larin saves the ship by reminding the lady mer that her dreadful vision will come to pass no matter what, but she and Jorn are left with no way to avoid the foreseen devastation.